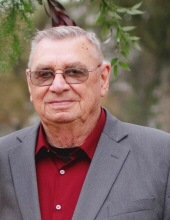 BLOOMINGDALE- Jerry Lee Warner, 80, of Bloomingdale, Indiana passed away at 12:43 pm Saturday, November 17, 2018 in the emergency room of Union Hospital in Terre Haute. He was a lifelong truck driver working for Dane Cox, Robert Chamness and Rose Brothers Trucking. He was born April 29, 1938 in Bloomingdale, Indiana to the late Paul Warner and Marian Davies Warner. Survivors include his wife of 56 years, Sarah Maynard Warner whom he married December 24, 1961 in Bloomingdale; also surviving, two daughters, Marty Ratcliff of Bloomingdale and Chris (Mike) Booe of Kingman; one brother, Bill Warner of Bloomingdale; one sister, Carolyn Larson of Danville, Illinois; half siblings, Candy, Lyle, Jum and Chip; grandchildren, Lyndsey (Nathan) Bell, Logan Cox, Hailey (Ben) Fischer, Nathan (Brea) Booe and Logan Booe; great-grandchildren, Briar “his little peanut” Bell, Gage Bell, Faith Bell, Henlee Booe, Jep Booe and Etta Booe. He was a 1956 graduate of Bloomingdale High School. He served with the U.S. Army stationed at Fort Knox, Kentucky. He enjoyed fishing, an avid NASCAR fan his favorite drivers were Kyle Bush and Davey Allison and he enjoyed late model Sprint cars. Services will be 1:00 pm Wednesday, November 21, at Gooch Funeral Home, 112 W. Howard Street, Rockville, with Celebrant Marta K. Adubato officiating. Burial will follow in Bloomingdale Friends Cemetery. Visitation is from 4-8 pm Tuesday at Gooch Funeral Home. To send flowers or a remembrance gift to the family of Jerry Lee Warner, please visit our Tribute Store. "Email Address" would like to share the life celebration of Jerry Lee Warner. Click on the "link" to go to share a favorite memory or leave a condolence message for the family.